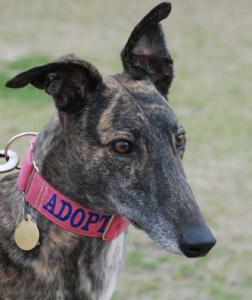 Cheyenne is a beautiful, brindle female that raced at 60lbs. She was born on June 8th 2008 so is 3.5 years old. Cheyenne is another daughter of the famous Dodgem By Design. She is a very sweet, friendly, loving girl. Cheyenne quickly became a very well behaved member of her foster home's pack. She is very bright and learns new tricks and routines with ease. She crates quietly and doesn't whine or bark in her crate so may be OK in an apartment or townhouse. Cheyenne is not a total couch potato like some greyhounds and does have enough energy to be a fun, playful girl that will want to do whatever you are doing. Because she learns quickly and wants to please and has some energy we think she would be a great greyhound for agility or obedience or maybe someone that hikes, walks or jogs. She would do great with another dog that wanted a playmate. She is such a loving, happy girl and likes kids so should make a great family dog. Because of her higher prey drive Cheyenne is not going to be safe with cats. She does respond to correction and really wants to please her humans in all things so might be trainable but we chose to list her as no cats just to be safe. During her time in foster care we have been introducing her to a variety of small dogs and she seems like she is going to be OK with them and she played very nicely with a sheltie. We will be glad to introduce her to any small pets you have and evaluate her with them. Cheyenne has been with us in foster care longer than any other foster at this time (since Nov 2011) only because she is not cat friendly. Our non cat safe dogs tend to take much longer to place even when they are sweet, gorgeous and very well behaved like Cheyenne. If you don't have cats please consider adopting one of our non cat safe dogs like Cheyenne.